By Dr. Mohammed Sa’id Berigari, Senior Soil &Environ. Scientist, USA, 30/9/2012. Abstract: Weeds compete with crops for soil and air space, nutrients, water; and sunlight. Using a single herbicide alone repeatedly and intensively for a long time to control weeds will increase the selection pressure. That would ultimately lead to evolution of some weed biotypes and spread in growth to the extent that crops can’t compete with the weeds. A good example is when Culpepper, S. in 2004 identified the first sample of Palmer amaranth or pigweed that had evolved resistance to Roundup (generic name glyphosate). The weed was so out of control that Georgia farmers were mowing down huge cotton acres. Today about 98% of Culpepper‘s farmers have glyphosate-resistant pigweed in their farms and it has spread to 76 counties in Georgia, USA. This problem is not unique to the farmers of Georgia. The agriculture communities worldwide face this problem. Therefore, scientists conducted field experiments in many states in USA and arrived at alternative solutions to control weeds. The focus now is on fighting weeds through diverse managements which include crop rotations, minimum tillage, and cover cropping. However, experts now consider weed resistance to herbicides a sociological dilemma more than a physiological problem. Herbicides are used to kill weeds that compete with crops for nutrients, water, soil and air space, and sunlight for their growth, thus, reduce their yields. And also, they are used to minimize tillage, therefore, save the cost of fuel and extra labor. John E.Franz, organic chemist worked at Monsanto Co., Missouri, USA synthesized glyphosate [N-(phosphonomethyl) glycine] in 1970 as a very effective herbicide. When genetically developed cotton cultivars survived sprays with glyphosate herbicide in 1997, many US farmers began using it with Roundup Ready varieties to control weeds especially the cotton growers of the State of Georgia, USA. Such a practice was simple, safe, and did not harm crops whenever applied. However, in 2004 an extension agronomist at the University of Georgia, Stanley Culpepper, identified the first samples of a Palmer amaranth or pigweed that had developed resistance to Roundup (generic name glyphosate). By the end of 2007 the weed was out of control to the extent that the Georgia farmers began cutting down thousands of their cotton acres. Currently, about 98% of the Culpepper’s farmers face glyphosate-resistant pigweed in their fields, and it has spread to 76 counties of Georgia. Amaranthus palmeri (pigweed) is a fast growing C4 dioecious plant, having male and female plants leading to a high degree of genetic diversity, thus, high capacity for reproduction and developing resistance to herbicides. On the average a female plant of pigweed bears 40,000 seeds and few have produced 500,000 seeds per plant. Herbicide resistant weeds created problems not only for Georgia farmers and for other US farmers but the agriculture communities worldwide are facing this problem. However, nothing is really new in certain ways. Weeds have developed resistance to herbicides since the first triazine herbicides were used about half a century ago. What is new, however, is too much reliance now on glyphosate to control weeds. Consequently, this led to remarkable popularity of glyphosate-resistance crops. Currently about 95% of the USA soybean crops and 70% of USA cotton and corn are Roundup Ready. The outcome has been wide spread weed resistance to herbicides. Glyphosate tolerance recently found in at least 20 weed species that reportedly infest millions of crop acres. 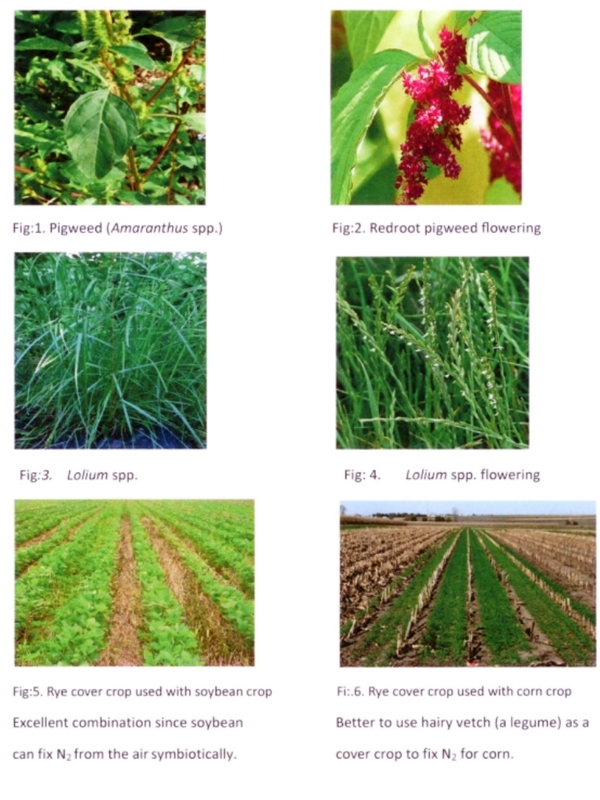 Some weeds, such as water hemp (Amaranthus tuberculatus) in the Midwest, USA and Lolium spp. in Australia have evolved resistance to three or more herbicide mechanisms of action. There is very little we can do to resolve that problem. The primary solution seed companies are seeking is the engineering of new cotton, soybean, and corn cultivars that can tolerate additional herbicides, such as glufosinate (DL-phosphinothricin); 2,4-D( dichlorophenoxyacetic acid); and dicamba( 3,6-dichloro-2-methoxybenzoic acid)- including “stacked trait” varieties that resist more than one. While these tools may help, scientists, also , want to see wider options of integrated weed management that relies less on technology and more on diverse weed fighting strategy, including crop rotations, minimum tillage, and cover cropping. According to Dave Mortensen, weed scientist at Penn State University, diversity management, although more difficult, is the only sustainable method forward especially with farmers’ who favor strict, no tillage farming. He said”We are putting more and more pressure on herbicides to do all the killing and that is just not going to get the job done down the road”. When an herbicide, like glyphosate, is applied repeatedly year after year over very large areas that could increase selection pressure on weeds to evolve resistance just like how bacteria develop resistance when antibiotics are overprescribed. The probability that any one plant will become tolerant to an herbicide is very low but is not zero. However, in the case of glyphosate repeated use on millions of acres did ultimately select for few individual plants among billions to survive it. And as glyphosate continued to exist in the environment, those glyphosate-tolerant biotypes - such as pigweed- began to reproduce in much greater numbers than their susceptible ones. This phenomenon, however, is not in any way unique to glyphosate or even to herbicides. Any weed-killing method will eventually select for plants that can resist it. The idea is to prevent or delay the evolution of resistance by reducing the selection pressure that any one method exerts. This is where diverse management plays a major role, and according to Bill Curran, weed scientist at Penn State University, it has three components: herbicides, tillage, and crop rotation. If a farmer does not diversify those three, he will face problems, but what is the right mix? It is a challenging question to answer. For that reason prominent weed scientists Curran, Mortensen, and others have been conducting research to reduce herbicide use, thus, the selection of resistant weeds. Apparently they borrowed ideas from crop growers who combat weeds without any chemicals: organic farming producers. Curran, about 10 years ago, began working with growers who wanted to reduce their dependence on tillage for weed control. Soon he realized the research might have implications for conventional growers as well. Many have been tilling less but spraying more herbicides as a result. One alternative method to both deep tillage and heavy herbicide use that Curran’s group focused on is winter cover crops, for example, cereal rye in soybean and hairy vetch in corn. Curran, Mortensen, and coworkers adopted a system in which they grow a rye cover crop under organic and conventional conditions and then rolled/crimped it down to form weed-suppressive mulch. When soybean was sown into the mulch, the researchers suppressed emerging weeds in the organic plots with a high-residue cultivator specifically designed for reduced tillage systems. In the conventional plots, the researchers sprayed a post-emergence herbicide. Therefore, herbicides are not eliminated completely under diversified practice, in reality, chemicals are very useful when soils are too wet or dry for mechanical weed control, Curran notes. However, herbicide use can be decreased significantly in these systems because the mulch does the weed-fighting work. In effect, you are using mulch as a preemergence herbicide according to Curran and you are hoping to get four to six weeks of weed control. In another investigation Curran and coworkers found that a combination of banded residual herbicide and high-residue cultivation reduced the need for residual application by 67% without significantly changing corn yield. However, this does not occur when weed densities are very high. Then it will be necessary to use heavy dose of an herbicide. These findings demonstrate the value of sharing ideas between organic and traditional systems. Curran thinks that both sides could benefit from each other when exchanging ideas take place more often. Matt Ryan, now assistant professor at Cornell University. As a graduate student working with Mortensen, Curran, and others he not only embraced cover crops and other organic methods to reduce herbicide use, but also, his efforts took him to the opposite direction of studying herbicide chemistry. Ryan stated that there is a rich body of literature describing the interactions between herbicides including methods of determining whether two or more chemicals applied together interfere with one another’s activity, fail to interact or combine to produce a stronger weed killing effect. That led scientists to the idea: could they, also, find interactions between non-chemical weed control practices? The idea is based on the “many little hammers” impacts of ecological weed management, Ryan explains. Certain weed-control strategies are weak when used alone, for instance, just increasing the seeding rate to make a crop more competitive against weeds “does not work”. However, when these tactics are used together, they can be more effective than would be expected from each method to control weed alone. That is really what the concept of” many little hammers” means. Ryan designed an experiment with two gradients: five levels of rye cover crop biomass and five different soy bean seeding rates. The result showed that the two treatments together gave greater effect on weed control than either one individually. Moreover, the findings offer insight into the reasons behind the improved control, which to Ryan is the most important point of all. The action of the rye mulch was related to seed size. The mulch delayed emergence of small-seeded annual weeds long enough for the larger-seeded soybean to germinate and develop a competitive, weed-suppressing canopy. That mechanistic outlook is important for expanding the use of these methods and improving management in general, according to Ryan. He said “once you know why a practice is effective, you can apply that information to other situations and tweak the practice so that you maximize its effectiveness”. What these mechanisms often come down to, adds Culpepper, is weed biology”. Glyphosate kills regardless of biology or used to anyway. But now that glyphosate-resistant pigweed emerged, one has to understand the biology of this and other weed resistant weeds to herbicides if the objective is to combat them effectively. Pigweed is very competitive against cotton to the extent that Georgia farmers can’t allow it to exceed one or two inches in height or” they are mowing their crop down” Culpepper said. Therefore, now they use 2-3 residual herbicides at planting, followed by another three during the growing season to prevent the weed from sprouting. Pigweed seeds, also, can’t emerge from a soil at depth greater than 2-3-inches that is why many farmers have returned to deep moldboard plowing as another way to control pigweed emergence. Even then enough emerges that farmers hand-weed the plant to keep it from reproduction. Culpepper said that 92% of his growers last year hand-weeded 54% of the entire cotton crop. That reflects the scope of the problem. Culpepper adds that while this combination of tactics is working now, however, it is also expensive and economically not sustainable as cotton prices have fallen. That is why he, too, for the past six years has been conducting experiments with an integrated approach that includes cover crops and herbicides. In four of the on-going farm trials in Georgia, he and his coworkers have found that a robust crop of rye can reduce pigweed emergence by 70 to 90%. Like the Penn State weed scientists Culpepper then controls the remaining pigweed with herbicide, and the system still achieves important goals. It remarkably reduces the need for chemicals, thus, cutting the costs. It encourages the farmers to adopt conservation tillage. Most importantly, cover crop will extend the life of valuable herbicide chemistry such as glufosinate (Liberty) as Culpepper asserted” we have reduced the selection pressure. We are spraying fewer plants”. Will Farmers Adopt Diverse Management? This is the question facing everyone: How to convince farmers to embrace more complex weed management practices when they have been used to and dependent on the strength of herbicides like the glyphosate and the simple technologies such as Roundup Ready. The work is easier to embrace in areas like Georgia because farmers there essentially have no choice. However, in Iowa and Pennsylvania the goal of integrated practice is primarily to prevent future problems rather than deal with the current ones, thus, making it harder to sell integrated strategy. Owen said “Truthfully, until growers get [herbicide-resistance] in their fields, the likelihood of them actually doing something about it is unfortunately not very high”. According to Owen one thing could help weed scientists is more research into the economics of diversified approaches. Farmers are more concerned that these practices will cost more time and money, while offering little benefits other than preventing a problem they may not actually face. However, Owen and coworkers found, in a number of on-farm studies in six states for five years, an integrated system involving crop rotations and diverse mix of herbicides actually saved money, or at least didn’t cost farmers anything more than their standard practices. Even so, change is difficult, that is why Owen thinks agronomists must collaborate with sociologists and psychologists to overcome human barriers. Scientific facts are established “Now what do the social sciences say about getting growers to accept?” Owen is also, working with a group from the Weed Science Society of America to develop a set of best practices-with a clear and simple language - that will hopefully bring more farmers to adopt such practices. Mortensen suggests handling this issue from a totally different angle. Emphasis should be focused on the benefits of diverse management. Cover crops, for example, don’t just suppress weeds; they also reduce insect pressure, enhance soil tilth and soil organic matter, and stop nutrient and herbicide runoff. Yet, they still are mainly deployed to fix one environmental problem at a time; for instance, concerns over the steady decline of Chesapeake Bay recently led Maryland State to adopt a program that pays farmers to plant winter cover crops to curb nutrient runoff. Consider taking the same program and listing all the benefits that cover crops provide as well as eliminating the negative effects that would help growers to adopt diversified approach. And as long as research continues to focus on the benefits of the diverse system, there is hope that more farmers will embrace such a system. As a long term management strategy, experts agree, that if farmers do not use nonchemical methods for weed control such as crop rotations, cover crops, and tillage. Then eventually, few individual weed biotypes will emerge resistant to 2, 4-D, dicamba, glufosinate, glyphosate, and to other new and old herbicides selected for their successful weed killing capacities. The author of the above article relied significantly on various parts of the one presented in reference (2). 1. Bomgardner, M.M. 2012. War on weeds. CSA 90(21): 20-22. Management. Crops, Soils, Agronomy-CSA News Sep. Issue: 4-10. 3. Gunsolus, J.L. 2008. Herbicide resistant weeds.